Usually when historians discuss going to the archives or using archives, they mean that they are going to a repository that holds a significant amount of these records. Oftentimes archives are located in libraries and museums. Cities and towns often have their own archives that are often publicly accessible. Official bodies such as governments, businesses, or professional organizations also create their own archives. Others are private collections; some historians will talk about building their own archive. For example, I have slowly been building a personal collection of queer and feminist cookbooks within my own apartment for my own research purposes as many of these books are unavailable elsewhere outside of used book bins. What is going to an archive like? What is the experience like? No two archives are exactly the same. 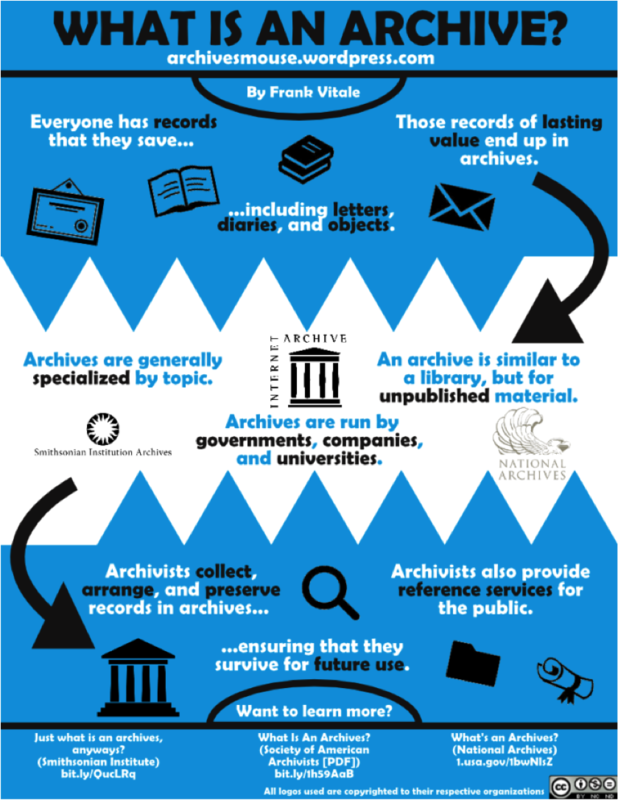 Different archives have their own procedures. When you go to an archive, the archivist will take you through the procedures specific to their own collections. Oftentimes you can find information online about a specific's archives procedures. Generally you will arrive at the archive during either their set open hours or during the time of your appointment. You will sign in. You may need a letter of introduction from a professor if you are dealing with rare materials (see the "in advance of a visit" section). The archivist will bring your requested materials to your table or desk. You may be able to only remove one folder at a time or request an entire box. Typical procedures require that you leaf through materials in the order that you received them in and return them in the same order. Depending on the age and kinds of materials you are working with, you may be asked to wear white gloves that they will provide. You may also be asked to use book supports and book snakes/page weights. Many, but not all, archives allow you to take photos of materials. Check ahead of time. Since I have limited time and funding available, I typically process archive materials quite quickly-- taking photos of everything that might even be somewhat useful and not spending the time to read the entire document until days, weeks, or even months later. It's not uncommon for me to take 2000 photos in a day, but remember this is specific to the type of research I am doing. Some historians will sit in a reading room (the name of the room that materials are brought to) for days with a single document. Food and drink is typically banned. Most archives require that you use only pencils (pens can bleed ink). Check in advance if you can bring your laptop for note taking. If you are ever unsure of how to proceed, ask the archivist for advice. 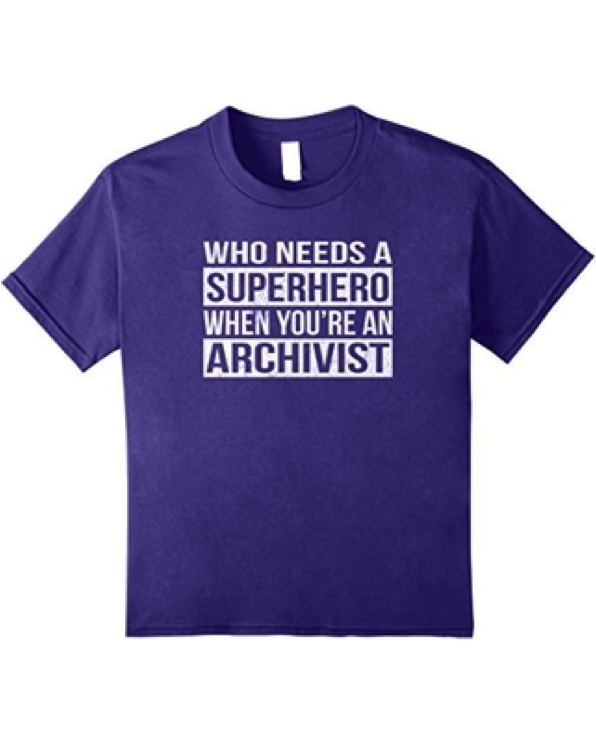 Archivists are there to help. This next statement often elicits a groan and eye roll from my students, but archivists are superheroes. Having personally conducted research at over 25 physical archives, not to mention countless digital archives, I have had overwhelmingly positive experiences with archivists. They know their collections better than you ever will and usually they are more than happy to recommend collections that you didn't know even existed. Look at the footnotes/ references of other books on the topic. What archives did that researcher go to? If you are studying local history or family history find out if your town/city has a municipal archive. I highly recommend checking out an archive's website in advance of any visit. Materials you are interested in looking at may be stored at an offsite facility and not be available if not ordered in advance. If you have any questions about procedures, most archives list a contact email address that you can direct your questions towards. If the archive has an online catalogue, take some time to find out how to use it. A simple keyword search will not always work. Many archives have finding aids which will usually have a summary of what kinds of materials are included in the collection, how many linear feet or how many boxes are included (so you can get a sense of how much material the collection contains). Here is an example of a very thorough finding aid (not all finding aids are this detailed). My name is ___. I am a __(if you are a graduate student or scholar say so here. Make sure to state your institution. If not, don't worry) and I am researching __(quickly describe your topic. You may slightly change this description depending on the archive). I was looking at your website and see that you have the papers of ___ (use the code/file name/box name/collection name). I am interested in visiting __(dates)__ and would like to look at these files/boxes/microfilm. I was wondering if you have recommendations of any other collections that are related to my topic. I am also interested in seeing related materials such as (list). In preparation of my visit, I was wondering if I need to request materials in advance. Does the archive allow photography and are there any limitations on the number of photos (this question is important because you aren't going to want to plan on taking hundreds of photos if you have to fill out a form or pay for every photo- double check)? Bring back up drives. Back up your files immediately (especially if you are taking numerous photos). I once met a man who brought 4 separate external hard drives and kept one in each bag he owned. I prefer to save files to my computer, my external hard drive, and also to an online cloud platform. Take a photo of the box number and folder number. This will be useful when you are writing citations later. There are apps that immediately change all of your photos to word searchable pdfs- consider using them. Ask archivists about copyright and usage. In most cases you can take pictures for your personal use but cannot publish the images. Some collections are also protected and you need to get permission before accessing the material. Government documents may contain redactions. Ask in advance of a visit! Even if you are not a professional historian you can go to the archives! I recommend that you use these fantastic resources. You never know what you will find in the archives! You might find a tape that wasn't mentioned in the finding aid where someone describes in-detail the process you are researching. You might find awesome concert posters or photographs. Or you might have a frustrating day and find nothing useful. And that's okay. As historians we have some idea of what we might find, but part of the fun of doing history is being surprised, having our assumptions challenged, and learning something new! Archives are constructed by other human beings who have their own biases. Marginalized communities and/or historically marginalized communities are often marginalized in archives themselves. Saying this does not discount the important role of archives/special collections but it is important to remember. Maynard, Steven. "The Burning, Wilful Evidence": Lesbian/Gay History and Archival Research." Jimerson, Randall C. "Archives and memory." OCLC Systems & Services: International digital library perspectives 19, no. 3 (2003): 89-95.